The ICT Innovation Framework (ICTIF) was used by the NP3 Project to categorise ICT use in its study schools. The ICTIF is a variant of the Digital Technology Impact Framework (DTIF) which in turn was an updated version of The Computer Practice Framework (CPF). The ICTIF consists of three main dimensions, which are illustrated in Figure 1 and explained below it. Quantity relates to the proportion of available study time that digital technology is being used by the learner. This underpins the other two dimensions. The Focus categorises the objectives underlying the use of ICT. 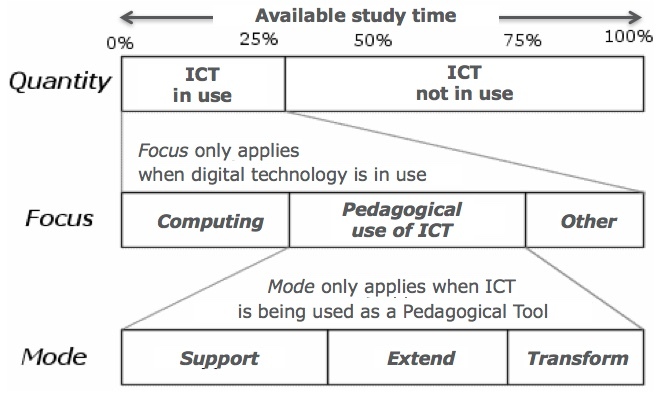 As illustrated in Figure 1, if ICT is not in use by the learners then the Focus dimension does not apply. The Mode Dimension of the CPF builds upon the Focus dimension, as illustrated in Figure 1, to show the impact that digital technology might have when the Focus is ICT. 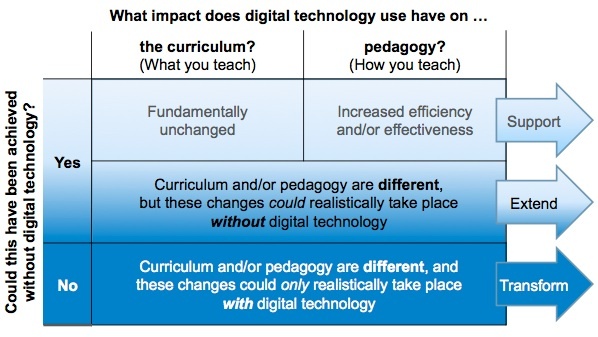 The Mode specifically looks at the impact of using digital technology in relation to changes in the curriculum and pedagogy, as illustrated in Figure 2. This page was last modified on 23 June 2017, at 13:36.